Joe Tate has hooked up with a couple of singers who do the Jimmy Buffett songbook. Chris Wilson, who often plays the No Name Bar with Eugene Huggins, plays bass and sings with Don Trujillo who handles the chords on guitar. 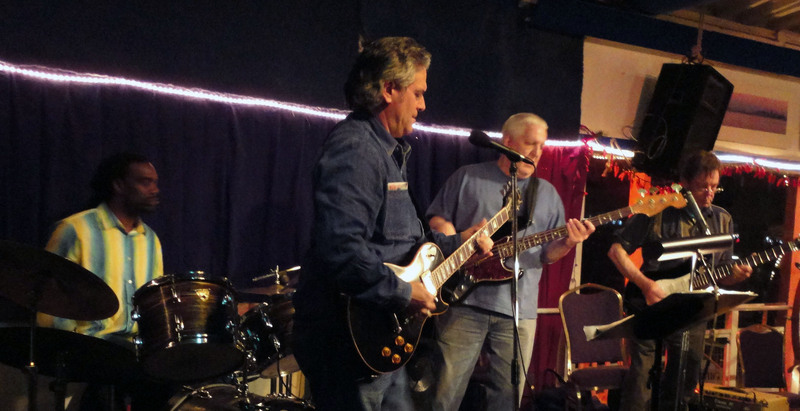 This meet-up was arranged by Lonnie Walter who plays here every Saturday with Joe Tate. 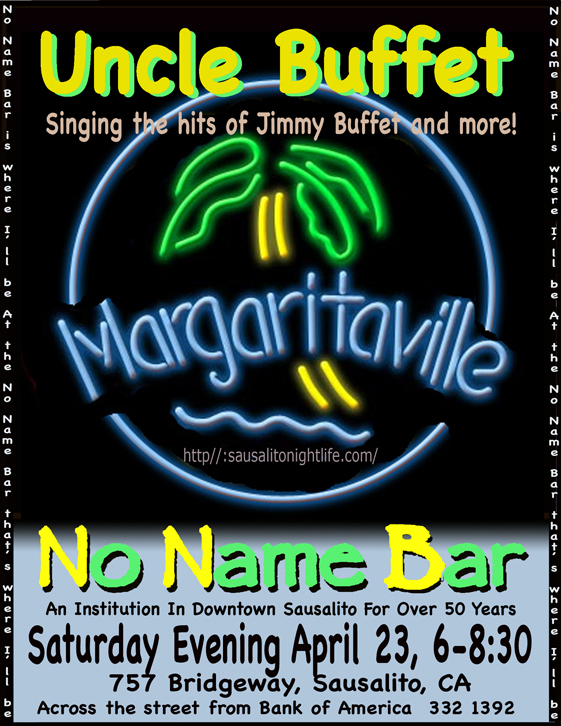 Excluding Tate, they have a regular Jimmy Buffet show that they perform around the Bay Area working with other artists. Anyway, they have a good sound which generates a lot of sing along action from the bar. Joe Tate opens with Scotch And Soda followed by Blueberry Hill. The next bite is Jimmy Buffett’s Changes In Latitude and Margaritaville, perhaps his best known and loved songs. Extra tips soon guaranteed hearing Margaritaville again in the second set. Don Trujillo and Chris Wilson delivered some nice harmony on Cheesburgers In Paradise and Son Of a Son. Tate came back with Minnie The moocher and Little Egypt just to give things a little balance. Some of the JB songs have hand clapping breaks in which everyone keeps time while Don does some kind of Caribbean rap that was profound and unintelligible at the same time. Chris Wilson sings up a storm on Wait In Vain and we hear Trujillo leave the JB format on Mercury Blues, the K.C. Douglas/Robert Geddins hit from 1949, a year when Mercurys were all the rage. Tate finishes out the set with Satisfaction in an attempt to, sort of like, not fit in. The second set featured more of JB’s big hits including Music for Money, Pencil Thin Mustache and Volcano. 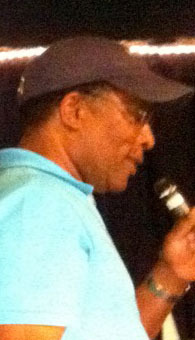 Trujillo also sang Brown Eyed Girl with vocal assists from Tate and Wilson. Tate also came back with good old Down Home Girl and Poison Ivy, both Leiber/Stoller songs from the fifties. It was a very pleasant evening with a friendly mixture of tourists and locals. 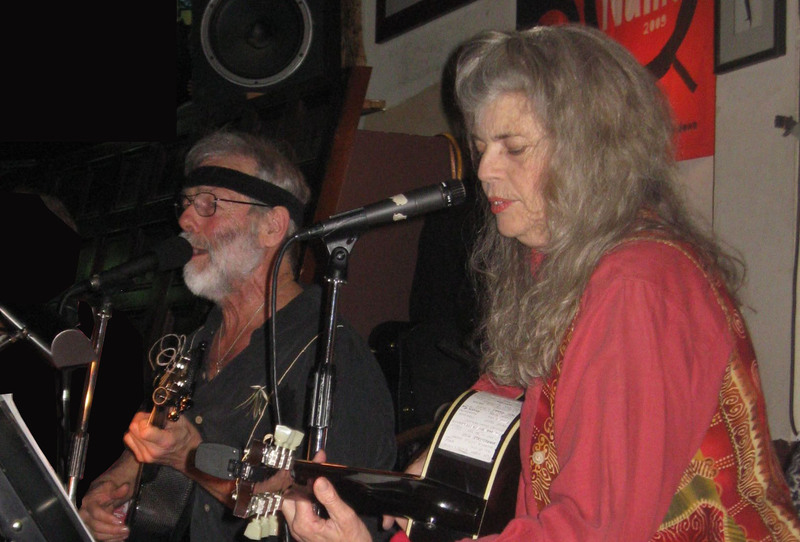 Maggie catfish and Joe Tate, best known as members of the Redlegs in their roles in the Movie, Last Free Ride, have been doing some gigs together as The Gaters. The name derives from having come from the Gates, an area along the Sausalito waterfront where Liberty Ships were built in WWII. The Gates had become a haven for artists and musicians, along with many other bohemian types who constructed makeshift houseboats on these Sausalito mudflats. The Redlegs fit right in with all this and spent many years raising hell at all the local parties. They played a form of rock n’ roll that thumbed its nose at the world but was at the same time a joyous celebration of the local community. It all seemed hip enough during the late sixties before the area was rebuilt into an upscale houseboat marina. 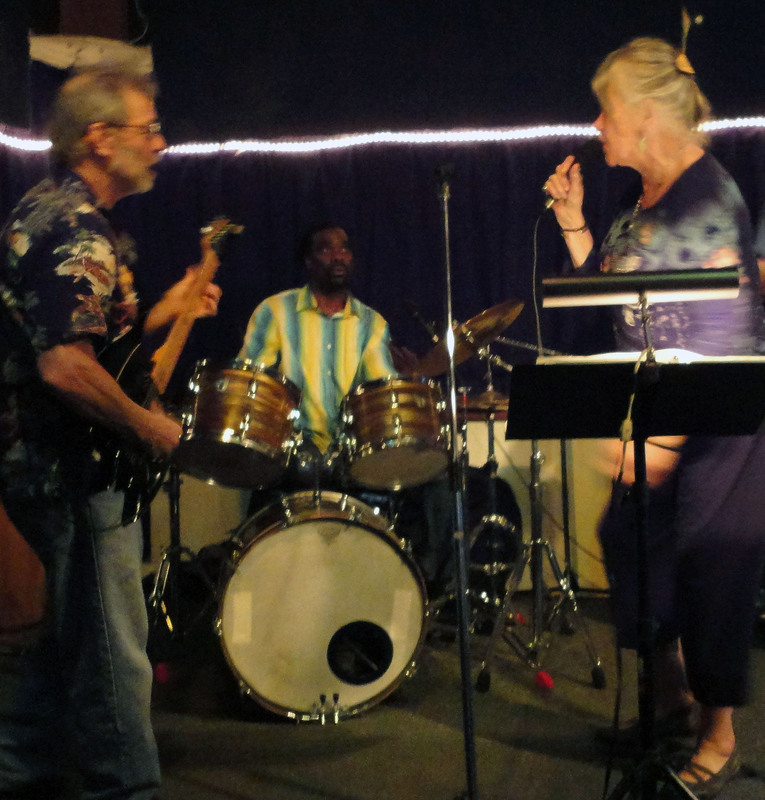 These days Maggie and Joe are content playing conventional rock, old standards, hawaiian and just a few of the old Redlegs numbers that are still craved by a few diehard fans. They delivered all this at Saylor’s Restaurant and Bar last Friday. Not surprisingly, there were a few people there from the old days. 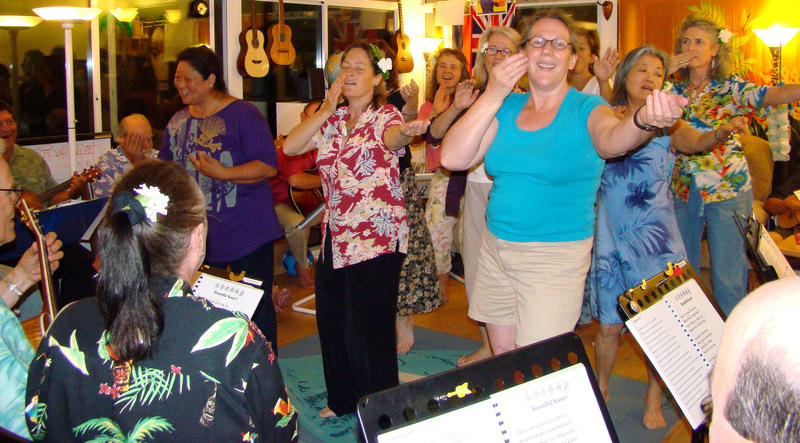 There was also a large contingent of folks who came to hear the Hawaiian music. They weren’t disappointed. 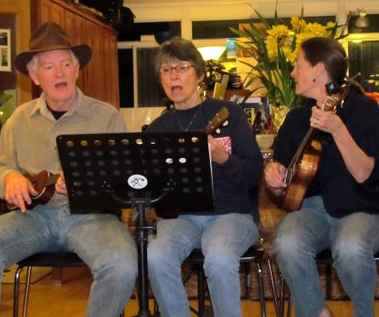 Maggie Catfish lived in the Islands for many years and has absorbed the culture and music of Hawaii. 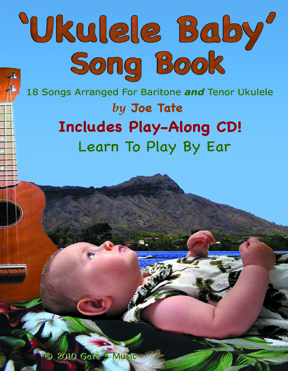 Likewise, Joe Tate sailed to the Islands in 1977 but didn’t study the music until much later. 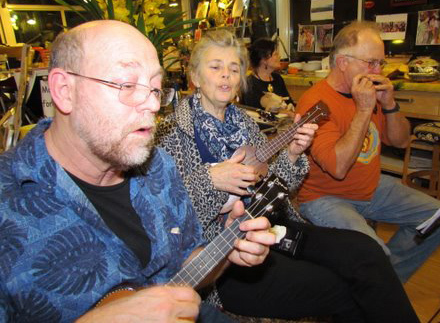 He now plays with the Ukulele Friends Ohana which specializes in the Hawaiian. 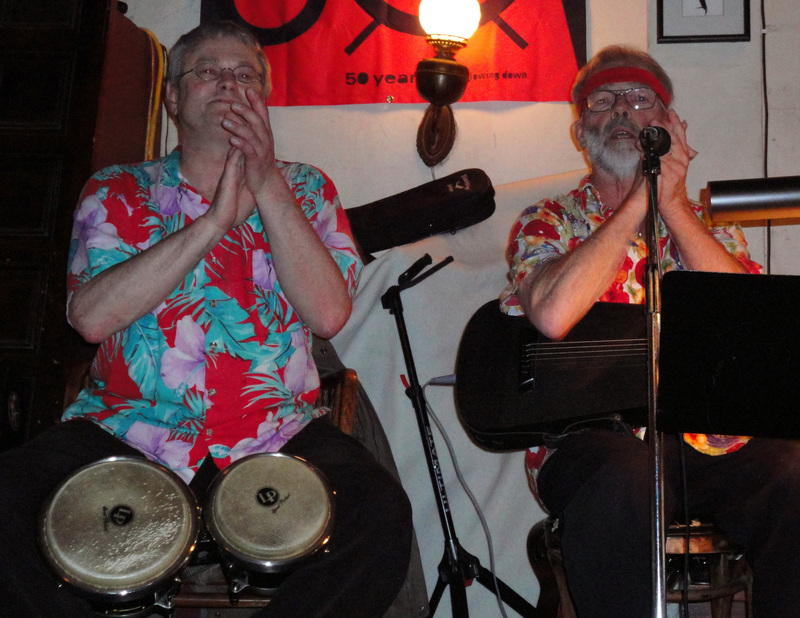 The first set was mostly Hawaiian but gradually gave over to standards and old Coasters songs. Later, some of the old Redlegs songs came out like Nasty Little Boy and Old Matt. There were a some good sit in performances too. 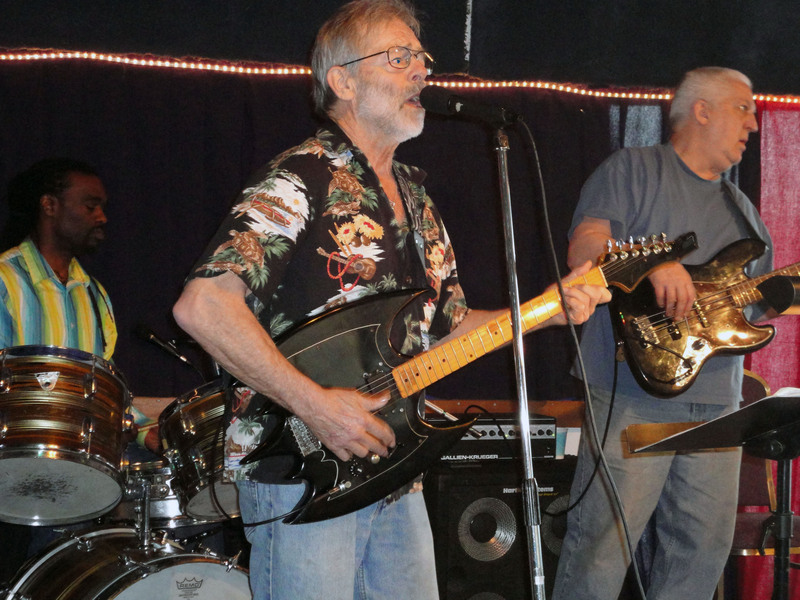 Tom Barr played harmonica on many of the blues numbers and Skip Dossett sang some Elvis songs. Joe Tate’s rendition of Whiter Shade Of Pale is noteworthy because it uses a harmonica to play the Hammond organ solo made famous by Procol Harem. The next night they are at the No Name Bar where they usually appear with percussionist Lonnie Walter, who couldn’t make it tonight. Tom Barr came though and he assisted on blues. There were more Redlegs fans tonight than Hawaiian aficionados so, rock n’ roll prevailed. There was also an extra helping of RedLegs songs including Sailor’s Love Song, Love won’t Change and the ubiquitous Nasty Little Boy. There was also plenty of New Orleans sounds like Rockin Pneumonia and some Fats Domino tunes. Joe also sang a new song called Roosevelt Blues which tells a story of Abraham Lincoln and Franklin Roosevelt. This song tells it like it is, a must hear for all Americans. 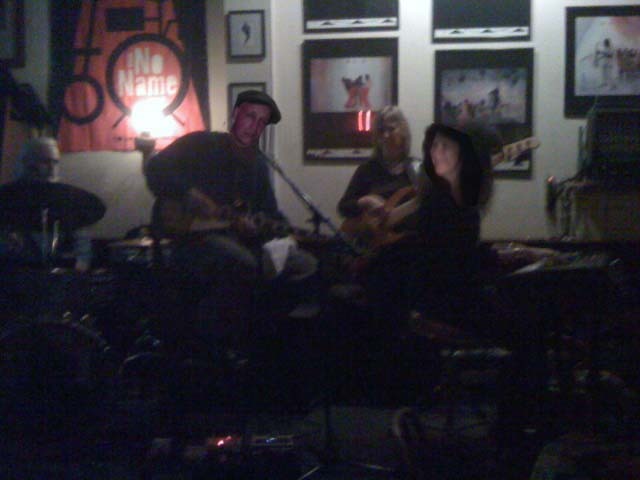 It was a bar hopping evening starting at the No Name Bar in Sausalito at 6PM. 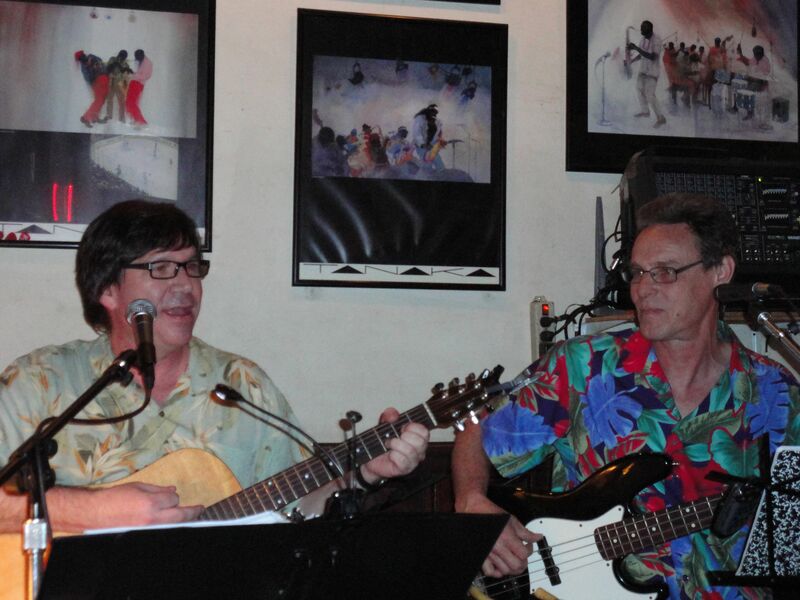 Joe Tate plays here every week at this time along with Lonnie Walter and one other of his rotating guests. 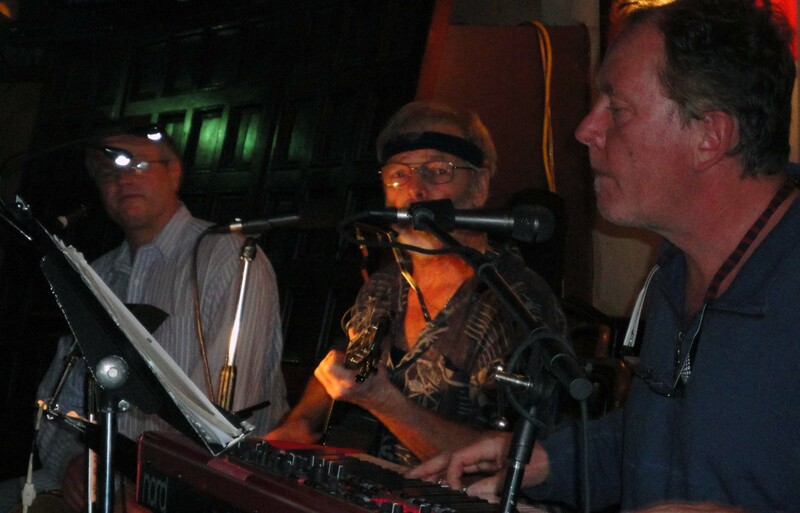 This week, Jerome Phillips rounds out the trio with his very experienced keyboard playing. Joe Tate performs his usual New Orleans swamp blues along with a couple new numbers like Little Egypt, the famous Leiber and Stoller song best known for its Coasters recording. They also let loose with some good old Chuck Berry stuff like Nadine which Jerome sings to good effect. Jerome also performs some nice instrumentals here and there while Tate scurries around with the tip jar. They finish up the night with Cab Calloway’s Minnie The Moocher and finally Chuck Berry’s Rock and Roll Music. Anyway, The Tickets do a lot of the popular covers from the Rolling Stones and other great rock groups. They also do some very nice originals with clever chord progressions and diatonic melodies. Very reminiscent of the 60s. This is exactly the kind of music that Bill Graham wanted to get rid of. Happily, in spite of his best efforts, this stuff keeps coming back. There was a good crowd and The Tickets kept the dance floor full with such tunes as Born To Be Wild, the Steppenwolf classic that idolizes biker chic. Sung by Peter Herbert, who doesn’t appear to be the biker type, the song brings back memories of when Steppenwolf used to play at the Ark in Sausalito. Debra Clawson comes back with a ballad or two that showcases her one of a kind voice. 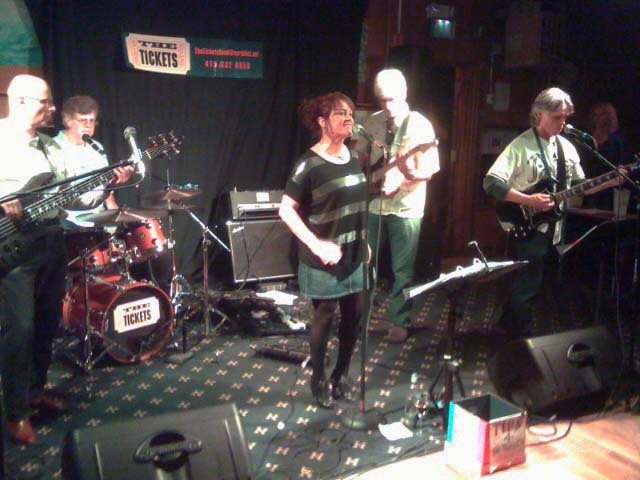 The next bar hop was back to the No Name Bar where Wendy DeWitt was making some very fine music with her excellent band. 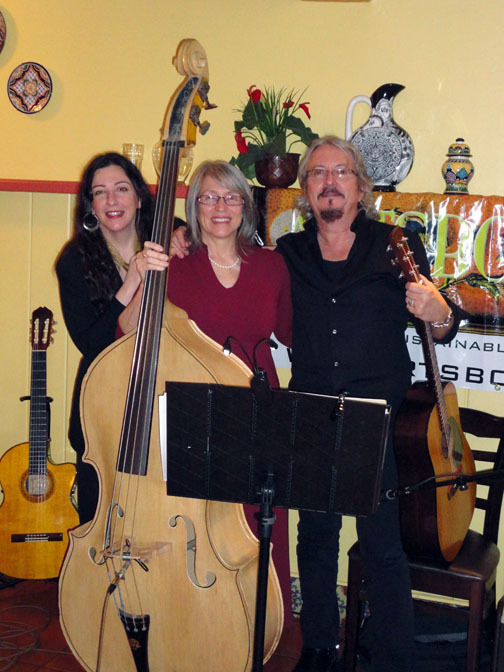 With Kirk Harwood on drums, Jan Martinelli on bass, and Steve Freund on guitar, this group is a force to be reckoned with. Freund’s mastery of the guitar is beyond words. But his powerful vocals leave little doubt that he is the real deal. Combined with the Queen Of Boogie Woogie’s over the top piano, it’s easy to see why Harwood and Martinelli get excited. Kirk Harwood in particular keeps bouncing up and down with every cymbal crash. He just can’t sit still. Anyway, this was real fun evening and hearing these folks was the perfect ending.